Country Club Road is in the center of Tucson today, but it was in the outskirts of town in 1939, the year that Swiss architect Josias Joesler and developers John and Helen Murphey broke ground on their only commercial project together – the Broadway Village shopping center. Joesler had been in Tucson for more than a decade at that point, making a name for himself by building homes for the wealthy. But it’s Broadway Village that really epitomizes his legacy, said University of Arizona architecture professor Brooks Jeffery. 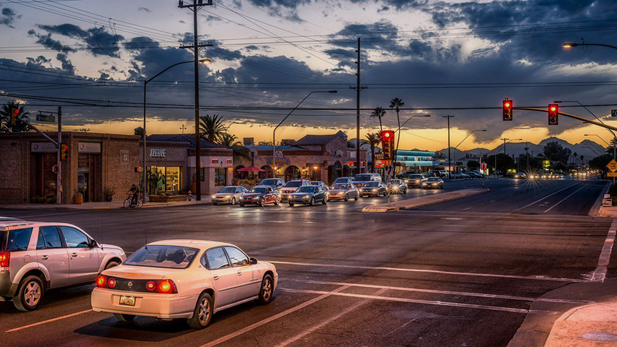 It wasn’t just the style of the building that was new to Tucson – Broadway Village is thought to be Arizona’s first stand-alone shopping center. “In other words one like a mall today where you park and then go in and experience a variety of different shops,” Jeffery said. Over the decades, the city grew around Broadway Village. The country club behind it was turned into a housing development called Broadmoor; the El Conquistador Hotel just a few blocks down the road was sold and turned into a mall – but by that time, the concept of shopping centers was hardly new. And at Broadway Village, shops came and went. Finfrock’s real estate company bought Broadway Village in 2008. Finfrock said they invested in the property despite the turbulent times. They cleaned the old brick and beams. They removed every nail, re-laid foundations and replaced sconces and light fixtures. But Finfrock said revitalizing a shopping center requires a lot more than just fixing the bricks and mortar. Finfrock announced recently the retail mix will change – once again – later this year when the organic grocery store Natural Grocers opens up shop in the space occupied now by Bon Boutique and by the adjacent import shop Zocalo, which has been at Broadway Village for 20 years. Bob and Karri Stowe own Zocalo and say they’ll find a new home for their shop – but they’re sad to lose their space. “We feel we are a great match for Broadway Village,” said Karri Stowe. Finfrock said it was difficult to tell the tenants their leases wouldn’t be extended – but his group’s original plan was to bring a grocery store back to Broadway Village. And change is one of the rules of the game. “Shopping centers are constantly evolving. It’s almost like a shopping center is a living organism,” he said. And so as Broadway Village moves into its 76th year, it continues its evolution – as does the city that surrounds it.